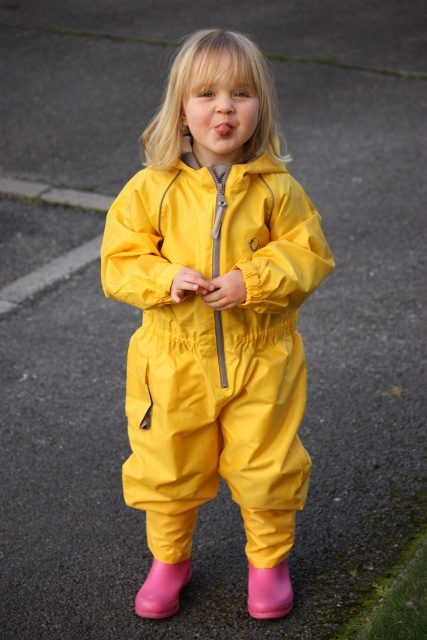 A little over a year ago, Lara became the proud owner of a pair of Hippychick all-weather waterproof dungarees. Since then, I've recommended Hippchick waterproof clothing to a lot of friends and they are the first place I would look when buying. This winter, Lara has gone a step further and is reviewing the Hippychick All In One All Weather Clothing Suit and Holly has been trying out the compact and bargainous Hippychick Pack A Suit. The two girls are well prepared for rain and snow now!!! You can't miss Lara in her top spec All in One all weather clothing suit. She is a little yellow beacon of fun when she is pootling around the garden. 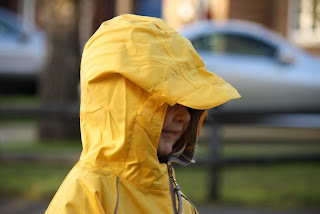 Lara has also told me (about a million times) that next year when Legoland re-opens that she wants to wear her Hippichick suit on the log flume so that she doesn't get wet. The All Weather suit has celcro fastenings around the ankles and wrists to make sure water can't get in. This also means a great fit when your child is trying to get into wellies because you can wear them inside or out without faffing. It is made from teflon-coated nylon and can withstand wind and rain without making your child hot and sticky on the inside. Lara seems comfortable for long periods of time in hers which means she can play outside, whatever the weather. The hood has a small peak to keep rain out of her eyes (which has a lovely soft fleece lining around the hem). There is also a small amount of elasticated adjustment around the waist which means that Lara still has growing room in her suit. The All in One suit is avaulable for ages 12 months all the way through to 4 years. Lara is very tall for her age and is wearing age 4-5 clothes most of the time but her All-in-One suit still has PLENTY of space for her two grow throughout the spring. The suit costs from £27.50 and is also available in pink and blue on www.hippychick.com. Holly's suit is the very affordable Pack A Suit which comes in a small pouch about 20cm square. It is compact enough that I can just put it into the changing bag in case we need it. At £14.99 it is a very affordable option if you don't spend so much time out in the wind and rain. 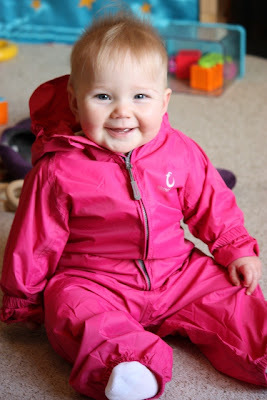 The PackASuit is also available from 12 months up to 4 years (Holly is admittedly a little drowned in hers at present as she is only 7 months old; but she is big for her age and it means she can join us in the garden when its wet). Considering that the Pack A Suit is the cheaper waterproof option from Hippychick, I was expecting some comprimises on quality and functionality but in fact the Pack A Suit also has a peaked hood and elasticated wrists and ankles as well as a range of colours. The different really is the fabric - this is a coated polyerethane which means you have to be a bit more careful about putting it in the washing machine (no bio detergents or fabric softeners allowed!) but unlike some cheap waterproofs I've tried before, this one is still breathable and comfortable. We are looking forward to spending quality time in the garden and out and about this winter with the girls in their waterproof Hippychick clothing.